Fresh numbers tracking call volume at beleaguered Internal Revenue Service help centers appear to confirm warnings from the tax agency’s leaders and its main employee union that budget cuts are making life miserable for callers as well as staffers as the April 15 filing deadline approaches. Internal IRS performance data released at the Urban-Brookings Tax Policy Center Wednesday by the National Taxpayer Advocate showed that as of April 6, attempts by taxpayers to dial call centers rose to 66.5 million—up 4 million over last year at the same time. 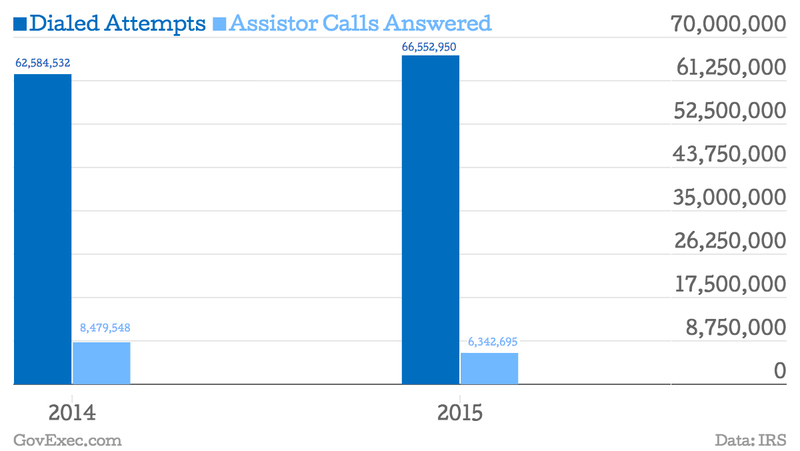 About 6.3 million of those calls were answered. The agency computed a “level of service” of 37.4 percent, down 33.7 percent from last year. (The level of service looks at a smaller subset of several types of calls than the overall dials.) Average wait times rose 10 minutes. Numbers released Thursday by the IRS itself showed that the service has processed 96.9 million returns as of April 4, about 1.2 million fewer than the 98.1 million at a comparable time last year. The number of visits to the IRS website—a practice the agency encourages—rose from 234.5 million in 2014 to 262 million so far in 2015, a rise of 11.7 percent. Nina Olson, the National Taxpayer Advocate, said, “In 40 years at this, I’ve never seen anything like this filing season on the phones, with only four of 10 calls being answered.” Only 25 percent of taxpayers who call for assistance are getting through to a live person, after a 22 minute wait, she reported. And the number of so-called “courtesy disconnects,” in which a caller is immediately told via a recording that they should try again later is seven times that of last year. Olson said as a tax administrator, she can see the “downstream consequences” of the fruitless calls, which create a need for an IRS agent and Taxpayer Advocate Service staffer later on to resolve the issue. “There is no answer to the phone problem but more human beings—it can’t be solved online,” she said.